Electric cars are proving to be a massive hit in Norway. Almost half of all new passenger car sales in 2018 were electric or hybrid vehicles, according to the latest numbers. This figure far outstrips other countries around the world. Neighbouring Iceland came in second at 19%, while Sweden was third with 8%. Drivers of petrol and diesel vehicles in the Norwegian capital, Oslo, have to contend with congestion tolls and fewer parking spots. Meanwhile, the city council is busily building cycling infrastructure and aims to have the centre free of fossil fuel vehicles by 2024. But the enthusiasm for electric vehicles is driven by more than just a desire to protect the environment. Buying and running a car in Norway is an expensive undertaking. The recently combined car tax and insurance levy is calculated on vehicle weight and emissions; it could add anything between 29% and 100% to the purchase price. Electric vehicles are exempt from this high level of duty. For now, at least, they are the prudent choice. But the current levels of subsidy are due to expire in 2020. With a population of just 5.3 million, Norway may have more new electric cars per capita than anywhere else, but it is still a minnow in global market terms. 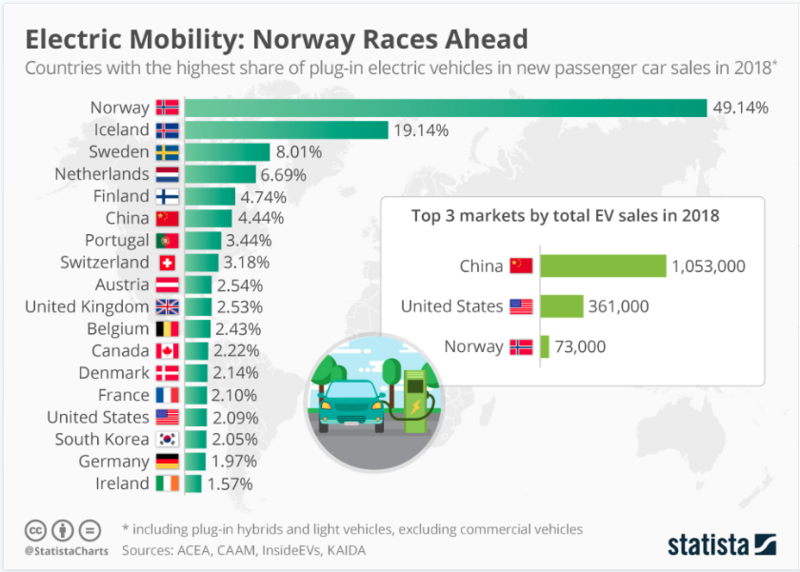 At just 4.44% of new car sales, the overall number of electric vehicles sold in China in 2018 dwarfs the number gliding noiselessly around Norway: 1,053,000 and 73,000 respectively.